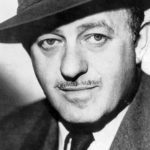 Ben Hecht was an American screenwriter, director, producer, playwright, journalist, and novelist. A journalist in his youth, he went on to write thirty-five books and some of the most entertaining screenplays and plays in America. He received screen credits, alone or in collaboration, for the stories or screenplays of some seventy films. At the age of 16, Hecht ran away to Chicago, where, in his own words, he “haunted streets, whorehouses, police stations, courtrooms, theater stages, jails, saloons, slums, madhouses, fires, murders, riots, banquet halls, and bookshops”. In the 1910’s and early 1920’s, Hecht became a noted journalist, foreign correspondent, and literary figure. In the 1920’s, his co-authored, reporter-themed play, The Front Page, became a Broadway hit. "I’m a Hollywood writer, so I put on my sports jacket and take off my brain."